For DiskGenius, reserved sectors refer to sectors from the second sector (behind MBR sector) to the sector that is in front of the beginning sector of the first partition. In most cases, a track has 63 sectors and the first partition usually begins at the 63rd sector (it numbers from 0), so, excluding MBR sector, there are 62 sectors to be cleared. As to the case that sectors are not 63 or the first partition doesn't begin from the 63rd sector, DiskGenius automatically calculates sector number to be cleared so that it won't clear other sectors except reserved sectors. This function doesn't apply to GPT disk with GUID partition table. 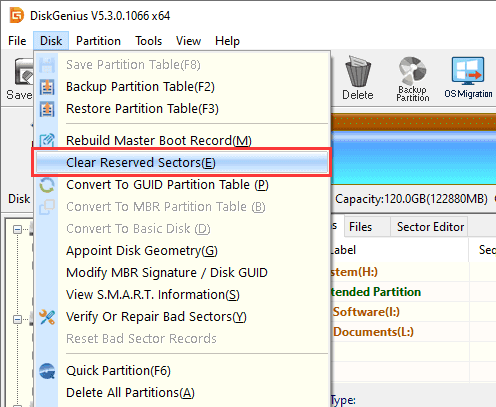 Step 1 Select a disk you want to clear reserved sectors, then click "Disk" and "Clear Reserved Sectors". Step 2 Click "OK" to execute the operation.